Excellent transient current discharge performance that meets less than 40V ESD threshold Class 0 CDM compliance. 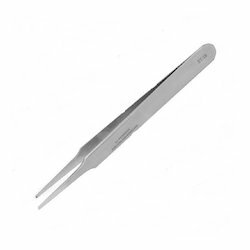 Ceramic tip tweezers are ideal for high-temperature applications such as soldering. Offering excellent break strength and surface finish with an extremely high heat resistance to 1000°C. Solder, chemical, solvent, and acid resistant. 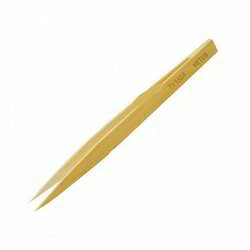 These tweezers are perfectly balanced for precision handlingof delicate parts. Working with ESD sensitive components? 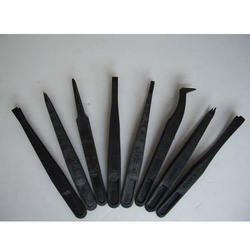 This is a set of 7 different ESD (anti-static) plastic tweezers. We use these in the labs. 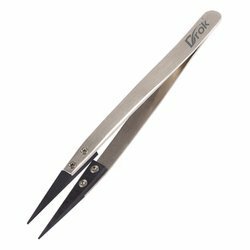 Very lightweight, and easy to handle, and won't cause ESD damage to component. Scraping, pulling on thin wires, gets you into tight spaces, and so many other application.